Here we have a gorgeous super soft grey Bashful Donkey by Jellycat. 8" from his head to toe. Jelly Cat Jellycat Patch Puppy Soft Toy BNWT. Condition is New. Dispatched with Royal Mail Signed For® 2nd Class. Jellycat Sleepy Bunny Book Comforter Soother Soft Toy Rabbit. BOING BOING BUNNY. Made of soft, fluffy beige material with boing sound when tummy is tapped or. JELLYCAT / KITTEN. bunny is sat down sharply on a surface. Little Jellycat. 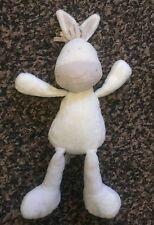 JELLYCAT J2023F. rattling bell to inside. Knitted Soft Plush Toy. knitted multi coloured body. satin ribbons to front and wings. velcro strap to top. GOOD CONDITION. BASHFUL BUNNY RATTLE. Made of soft, plush blue material with bead rattle sound when shaken. SOFT PLUSH BLUE RABBIT.
. Good used condition Tag has J1001F on it . . Please see photos . Smoke free home. I always obtain a proof of postage and post within 3working days of payment thankyou for looking. When item received please leave feedback then I will leave feedback thankyou. Jellycat musical lullaby blossom bunny pull string crib toy. In good condition. Plays a lovely tune. From a clean, smoke free home. Please browse my shop for more vintage & modern toys, games, plushes, collectables and curiosities! All pre-loved plush toys are checked for rips and tears and are steam cleaned for peace of mind. We are happy to combine postage for multiple orders, saving you money and we always aim for a quick dispatch time. Have a great day and thanks for taking the time to look at our goods. Tags attached, unused. Some marks creasing to tags. Post within the UK and countries in the global shipping programme only-Paypal-Post within two days of received payment-thank you for looking. Jellycat Riff Ruff Old English Sheepdog Soft Toy New with tags. A brilliant stocking filler. Cute Old English Sheepdog, soft and squishy. Standing at approx 8” high. This will be posted quickly, many thanks for looking. Baby bunny toy - Jojo Maman. Britia Bunny Toy Rattle - Jellycat. Baby girls toy comforter and rattle bundle. You are buying a Jellycat Jellykitten Baby's Lamb Beanie Comforter Snuggly in great condition. Musical jellycat - blue bunny attached to a white star - cot toy. Jelly kitten cream donkey / horse. Good used condition. 5 Jellycat Crinkle baby books. Over all good condition, Jungly tails should make a nose when you squeeze the front cover but the battery has died, farm tails still makes a MOO noise when you squeeze the cover but it's running out. For sale Jellycat Beaky Bird, baby soft toy, approx 8" tall, in very good and clean condition. North Devon Hospice provides free care and support to patients and their families affected by cancer or other life-limiting illnesses. Used but still in good condition. 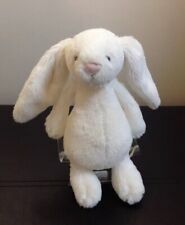 For sale Jellycat - Bebop bunny, soft toy, approx 13" tall (from head to toe), in good and clean condition. Brand new with tags on and full working condition, please see photos for exact details of condition. Brilliant gift for a new baby, hook means it can be fixed onto a pram hood or the cross bar of any carry cot. Thank you for looking, sorry I cannot accept returns as I am not a business. If bidding on multiple items please contact me about postage. We are a smoke and vape free home. BUNNY MUSICAL PULL. SOFT CREAM STAR / PINK RABBIT. Made of soft, plush cream and pink materials with cord pull - t he music plays clearly and the cord rewind fully. Jellycat Small Bashful Giraffe soft toy/comforter. Brand new but unfortunately without tags. Bean filled bottom and feet. Makes an ideal spare/replacement. Now retired, no longer available to buy. Immaculate condition. From a smoke and pet free home. Any questions, please ask. POPPET BLUEBELL BUNNY. SOFT BLUE RABBIT. REF: JELLY2694 - RETIRED 2016. Made of soft plush blue material with beans in bottom only. Lovely giraffe comforter, in good condition, there a couple of minor marks at the top of the comforter near the giraffe, which i have tried to show in the pictures, but they can only really be seem if you hold it up to the light. I have for sale this lovely jellycat book. The book is in great condition bar it had a sound button that no longer works. Please see my pictures. LITTLE JELLYCAT. SOFT CREAM BUNNY / MUSICAL PULL / SQUEAKER STICK. The squeaker stick works best held in the fist and squeezed. MATCHING BLOSSOM TRIO. Three Jellycat sheep all in good condition. Thomas Bear comforter in his blue gingham pyjamas, by Jellycat! Super soft, and cuddly! Jellycat Multi Segundo Snake Baby Comforter Rattle 27"
Squeak enclosed in the head. Rattle enclosed in one end. JELLY KITTEN Pink Bredita Bunny Rattle Baby Comforter Soft Toy 32cm / 12"